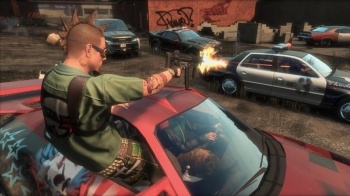 Former Realtime Worlds programmer Luke Halliwell has posted some interesting insights into what went wrong with APB, suggesting that the $100 million in investments the studio raised may have ultimately done more harm than good. Failed MMOGs are a dime a dozen but APB was a particularly noteworthy disaster. Realtime Worlds spent five years on it, burning through $100 million in the process, and still managed to turn out a game that tanked with reviewers and went from launch to lights-out in less than 90 days. How could things have possibly gone that wrong, that quickly? According to Halliwell, RTW was afflicted by deeply-rooted, systemic "cultural problems" that, rather ironically, could be traced back to the massive investments the studio had raised while working on the game. "One thing many old-timers agree on is that the investment felt like a turning point for the worse," he wrote on his blog. "Perhaps we just didn't know how to handle the investment. Perhaps the new senior managers brought in were harmful. Or perhaps our resulting growth rate simply exposed latent problems that had been there from the start. Either way, the money ended up feeling like a curse." Complacency was another big problem for the studio, which Halliwell also blamed on the massive influx of cash. "After the investment, we lost our scrappy startup mentality and used our money to build this highly 'corporate' culture, mimicking an established, successful organization," he explained. "We lost our hunger, our fear of failure, our focus on staying lean and making do, on building the simplest thing that could possibly work." APB was deeply flawed when it finally came out but Halliwell refused to point the finger at "specific design flaws" as responsible for RTW's downfall. "There were 300 of us, some of us there for years, and we spent over $100m," he wrote. "The problems had to run deeper than that. I believe our poor decisions (and there were plenty of them, not just in design!) are best explained as patterns of behavior within the context of a system that was not healthy." It's not the most cheerful story you'll ever be told, although Halliwell manages to avoid sounding angry or bitter, but it is an informative and even entertaining look at just how badly, and how quickly, things went sideways for Realtime Worlds. For anyone interested in a behind-the-scenes glimpse at one of the more spectacular videogame flame-outs in recent history (or just a cautionary tale about the perils of success), it's definitely worth a read.